As the season gets colder, two commodities become increasingly important: heavy clothes for going out, and books for staying in. 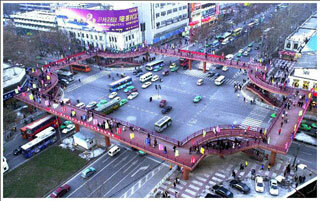 Luckily, the markets in the xiaozhai district of Xi’an are able to supply both more than adequately. Outside the city walls, the XiaoZhai district is one of the most developed parts of the city, and one of the most popular for Xi’an’s youth. 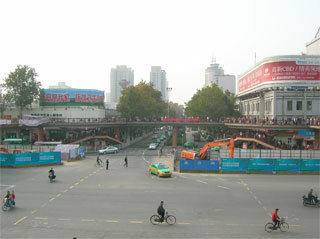 There certainly is no lack of things to do, between the Shaanxi Historical Museum, the largest bookstore in town, restaurants ranging from two-story KFC and McDonalds to the most expensive Korean food you are likely to find, and the many shopping centers and clothing stores that line the streets. For expatriates who have combed the insides of the city walls for things to do, this southern city district is a perfect stop. Book City is, by a wide margin, the largest bookstore in town. It stands at an impressive four stories tall and uses every inch of the space. While getting in with a bag or large purse is a bit of a hassle (you have to check it at a window by the door), the store is certainly worth checking out. For those of us who are not yet fluent in Chinese, most of the good stuff is on the second floor. There are several books and other texts in their original English, along with some of the Chinese Classics such as Into the West, the story of the monkey king, Romance of the Three Kingdoms, the ancient Chinese war Saga, or Outlaws in the Marsh, an epic tale of rebellion in the name of the ancient emperor. Many of the texts available are for students learning English, so many of the short stories have Chinese annotations on every other page. However, the meat of the story is still there, and make for good reading. There are a number of the classics, an excellent selection of short stories, some recent fare, and a number of books with titles in Chinese containing selections of essays in English. Looking for something to read is a large part of the fun. There is also a surprising amount of academic reading, such as Freud’s Interpretation of Dreams and Bacon’s Essays. Bring your wallet, though. Some of the larger books, especially the translations of Chinese works, can cost upwards of 100 Yuan. Outside of English titles, there are a few other interesting things Book City has to offer. Those who have a Chinese language tutor might want to come by and decide on a guiding textbook – there are a good number of texts for foreigners of any tongue to learn Chinese. In addition, there is a good selection of music and video CDs and DVDs, including classical music and several Chinese pop music titles. Along with educational videos, there are TV series and concert videos on DVD. For more adventurous Chinese language students, there are a number of books of any difficulty to attempt translating. For clothing shoppers, the XiaoZhai has a market for everyone. The Golden Eagle Guomao Shopping Center, at the Xi’an International Trade Center, has several of the finer clothing outlets you can expect to see in the center of town. A lot of solid men’s and women’s clothing selections as well as alteration service and some leather jackets and other clothes. For people with the budget, there are several shopping malls like this where you can expect fair treatment. However, for those working with a more restrictive source of funds or looking for an adventure, the underground fashion street is an excellent choice. When I say underground, I mean literally subterranean. Through what looks like subway entrances (the easiest to find is right next to the two-story McDonalds near the big red walkway), one can take an escalator down to the narrow hallways where most students go to shop. Given the number of people it can get a little claustrophobic, and its generally good advice to keep track of where your wallet is to make sure it doesn’t wander off with somebody else, but it is definitely worth it to wade through the crowds to get a look at the downstairs market. Bargain hunters will love it, as arguing about price is expected down here. If you stick to your guns with price you might be able to walk away with some pretty good deals. While most of the stores sell clothing, there are plenty of other shops worth looking into for cell phone accessories, model cars, or any number of other interesting items. Whether you need a coat to fight off the cold or are just looking to burn an afternoon or two, the XiaoZhai market streets are a great part of town to explore. It makes for a great change of pace from the bell tower area, and there are plenty of weird side streets to walk down if you are feeling adventurous. If you haven’t taken a chance to hit up this district, I would heartily recommend it.